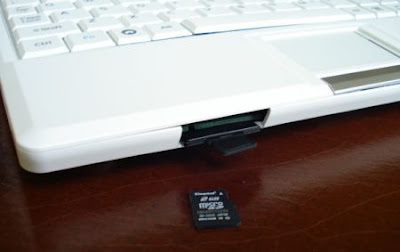 Sure, the Asus Eee PC comes with 2/4/8/12/20GB of onboard storage space and and SD/SDHC card reader for expansion. But that’s just not enough for some people. So the folks at Popular Science decided to hack away at the case and add another card reader. If you want to play along at home, you’ll need a SanDisk MicroMate SD Reader, a MicroSD card, and a USB A to B cable, plus a sharp knife, a lot of patience, and the willingness to void your warranty to smithereens. But when it’s all done, you can tell people you poked a hole in your Eee PC and it still works! Oh yeah, and you’ll be able to increase your storage, load alternate operating systems, and impress your friends. If your friends are as nerdy as you are. Add another card reader link doesn’t work.